NASCAR Sprint Cup frontrunner and team owner Tony Stewart was involved in a fatal incident during a sprint car race at Canandaigua Motorsports Park on Saturday night. The three-time Cup champion collided with 20-year-old Kevin Ward Jr, who exited his car and walked down the track gesticulating at Stewart during the subsequent yellow. Ward was then struck by Stewart's car, sustaining fatal injuries. "The driver of the car that spun exited the racecar and walked down the track onto the racing surface. "Two racecars travelling in tandem approached as the driver continued down the track, gesturing to the two approaching cars. "The first car swerved to avoid the driver out on the track. 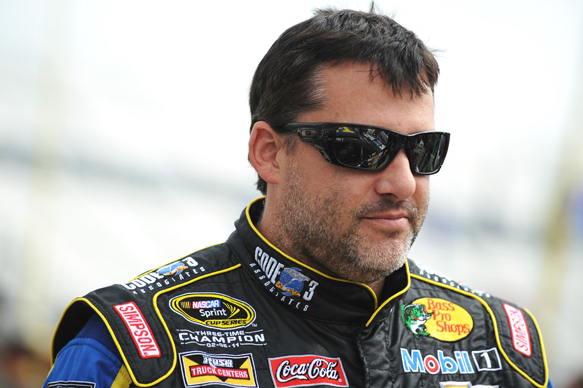 "The second car, operated by Tony Stewart, struck the driver. "The driver was treated by on-track medical staff and transported to FF Thompson Hospital, where he was pronounced deceased at 11.15pm. "At this point, Mr Stewart has co-operated with the investigation, which is ongoing." "A tragic accident took place last night during a sprint car race in which Tony Stewart was participating. Tony was unhurt, but a fellow competitor lost his life. "Our thoughts and prayers go out to his family and friends. We're still attempting to sort through all the details and we appreciate your understanding during this difficult time." Stewart is among several NASCAR drivers who regularly compete in short oval events alongside their stock car campaigns. His 2013 Cup season was cut short when he suffered a broken leg during a sprint car race at Southern Iowa Speedway last August. The Cup series is racing at Watkins Glen this weekend, with Stewart having secured 13th in Saturday's qualifying session before travelling to the sprint car event that evening.